If you have a pet that needs to be given medication, have no worries. Our experienced sitters are trained in administering medication through various methods and for many pets. At Pets R Family Too, all you have to do is provide necessary medication instructions and we will take care of the rest. And we never charge extra for administering medication if it can be regularly administered through your pet’s food. Our staff is experienced in providing care for older or injured pets, as well as pets that have had surgery or are being treated for a certain disease. We understand the special care that your pets need, and the peace of mind that you deserve. Whether you need an extra hand caring for your pet during a recovery, or you want to make sure that your sick pet is properly taken care of while you’re away, we can help. At Pets R Family Too, there is no time that is off the clock. We understand that being sick doesn’t take a break, and that’s why we offer our medication administration and nursing services during the day and even overnight. Not to mention that we also plan for virtually any situation that may arise. 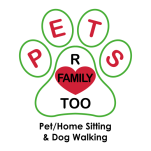 Through our regular pet sitting services for example, we have many processes for identifying medical issues, relaying that information to pet parents, and taking the right medical intervention. Before sitting any pet, or administering medication we learn about the pet parent’s preferred vets and plans for emergencies. At Pets R Family Too, our sitters know exactly what to do even if they can’t reach you. They will know any conditions that your pet has and also be able to identify the symptoms of other problems should they arise. As pet and homeowners ourselves, we know how stressful it can be to leave your loved pets at home while working or traveling. That is why we do everything and more to insure complete satisfaction. As a company we make sure to train our sitters in-house on treatments ranging from diabetic medication to surgery recovery. For pets undergoing specialized therapy we have even been known to visit hospitals along with pet owners to learn specific treatments for things such as chemotherapy. By visiting hospitals and vets directly when it comes to unique treatments we ensure that we are administering medication exactly as the doctors intend. We have also been known to drive out to pet owners that don’t have cars and take them to the nearest vet in the event of emergencies. No matter what pet owners or their pets need, we will provide the best service possible to insure their safety and satisfaction. Give us a call today at 702-614-7663 to learn more or schedule a meeting with one of our team members.